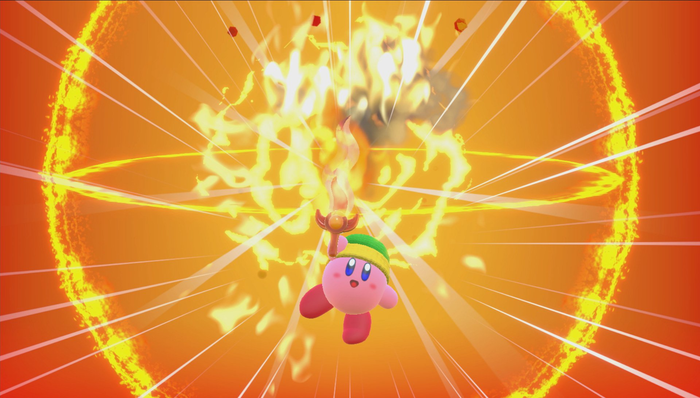 Kirby – Nintendo’s insatiable pink puffball – has finally made his Switch Debut in Kirby Star Allies. And while the formula hasn’t changed too much from previous iterations, fun, four-player action and endless copy abilities to combine elevate Kirby’s latest adventure to new heights. I feel that I should start off by going over the Kirby Star Allies’ plot – or its lack thereof. It’s as throwaway and predictable as any fan of the franchise would expect, and is mainly there to act as delivery system for the real star – the snazzy new gameplay mechanics. So in case any of you were wondering, here is the story in a nutshell: some heart of darkness something or other has been unleashed by some black mage looking dude (who probably wasn’t hugged enough as a child) and sends all of Dreamland into a tizzy. It’s now up to Kirby to utilize the power of love to win over the hearts of his enemies and assemble a ragtag team of allies to put an end of the dark force…so pretty much every Kirby game ever – moving on. As the name implies, Star Allies is all about recruiting enemies to your cause and utilizing their unique abilities to your advantage. The gimmick isn’t anything new to the Kirby franchise – the plump pink protagonist has been convincing denizens of Dreamland to fight alongside him for years., but what makes the gameplay mechanic so much more interesting is that Kirby can imbue abilities/weapons with elemental properties. Sure, that Sword Ability is all fine and dandy, but if you happen to have a Burning Leo on your team, you can upgrade your blade into a Sizzle Sword. And along with the added sensation of setting your enemies on fire and watching them run around all frantic-like while engulfed in flames, your blazing blade can also burn down bushes and melt ice blocks. Fire isn’t the only element you can expect to instill into your abilities as Water, Ice, Electricity and Wind are also on hand to further augment your powers. But that is just the tip of the iceberg. There are also unique abilities when you are equipped with non-elemental abilities such as Suplex, Parasol, and Spider. 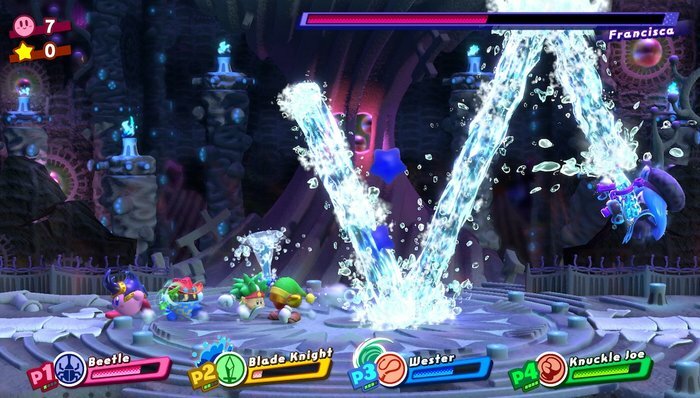 For example, amplifying the Parasol Ability makes your umbrella grow bigger, allowing you to better protect from falling debris or even block the flow of a cascading waterfall. Half of the fun in Kirby games has always been about coming across new enemies and wondering what sort of abilities they might bestow. That fun factor has now increased ten-fold when you slowly start to realize just how you can bolster one ability with another. Nintendo doesn’t fail when it comes to bringing Kirby’s most notable feature center-stage as there are no shortage of abilities you can mix and match. But while it certainly is refreshing to see the creativity on hand when you see abilities play off of each other for the first time, a part of me wishes that Nintendo would be a bit more daring, and introduce a radical number of new copy abilities rather use series’ staples over and over again. From a design perspective, the layout of Kirby Star Allies follows the pattern of Kirby games. Each of the themed worlds is broken up with a series of stages which culminates to a boss fight at the end. 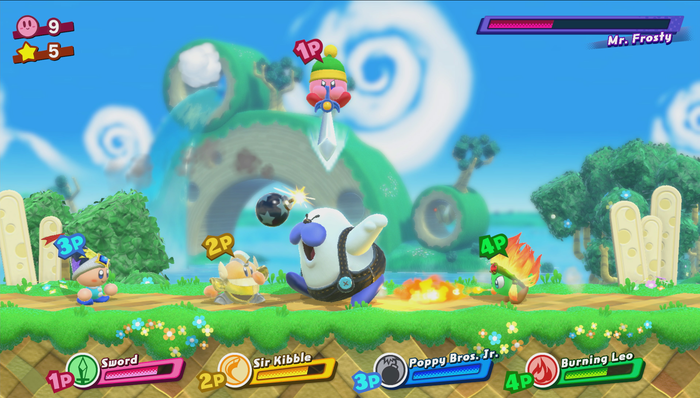 Extra Stages can be unlocked as well as a Dream Palace where players can recruit unique allies to Kirby’s cause. The soundtrack is every bit as engaging and memorable as the older games with plenty of fresh tunes mixed in with fan-favorite oldies for your listening pleasure. The aforementioned Extra Stages, for example, feature a classic Kirby tune which makes playing them so much more enjoyable. The simple score goes hand-in-hand with the games accessible nature as everything from the controls to the layout of each level and the placement of enemies, is all designed to make the experience as easy as possible. Which brings me to my own true gripe. There was a time in the Kirby franchise when being hit by an enemy would result in the player losing their ability. There was also time when reaching a hidden path or utilizing an environment-specific gimmick (like a cannon with an unlit fuse), meant holding onto a specific ability as it wasn’t readily available…and certainly not in the same room as the ‘puzzle’ itself. Yes, Kirby wasn’t meant to be a hard game and I’m not asking for it to be the Dark Souls of copy-ability-based, side-scrolling platformers. But I guess the point I’m trying to make is that perhaps I may have outgrown the series. It seems to be geared towards a much younger audience ,a fact that I wasn’t quite ready to accept as the series had always been a big part of my childhood. But when I realize that I had beaten the entire game without so much as losing a life and had accumulated more lives than I knew what to do with, it made me long for the days when the series was even the slightest bit challenging. Fortunately, co-op and additional modes have transformed Kirby into a crowd pleasure, and playing it with friends on the couch does more to harken back to a simpler time in gaming, than a difficulty spike ever would. Kirby Star Allies gets a lot of things right. It is brimming with color and dials the cuteness factor way up. While the Story Mode will last no longer than 8-10 hours, there is plenty of extra game to dive into once the main campaign has come to an end.